Check the parallel printer port setting in the bios, it should be EPP or Normal. Check there are any active resident programs that use the printer port, such as TWAIN drivers. You may have to remove it. The yellow power normal indicator of the programmer should light up, then the programmer power supply is normal. Set the DIP switch based on the displayed pattern. The software is included in the accompanying CD in a folder named Willem Software. After start the program, click test hardwar under Help menu. If the connection and power supply is normal, then appears: "Hardware present" Otherwise check if the programmer connects well with PC, or power supply is normal. 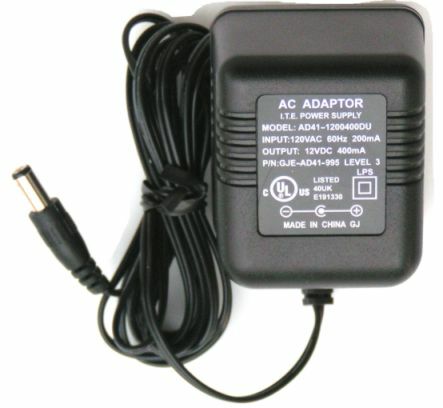 Note: the Vcc setting jumper only has effect when you are using AC adaptor as power source. For the USB power only 5V Vcc is available. When programming one chip, follow the program prompt to set DIP switch . Clear All: Clear the whole control signal, address and data output. Then you measure should be all 0V. Programming/Test. Programm the chip or test the SRAM. Erase. Erase content of chip. File : Open, Save, Exit. Device: Selection of target device/chip. Action: The operations for the taget device/chip. The bottom of main program screen is series tab window button. Click "Buffer" button,display buffer content. The first column of data is data address, last column is the data ASCII code, the middle is data hex value. 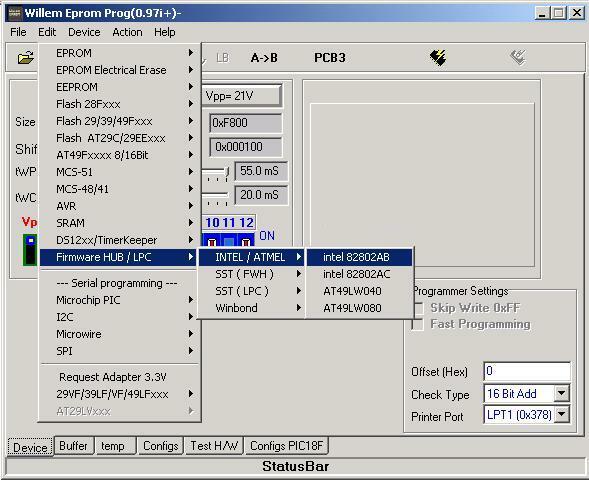 If internal EEPROM exists in PIC MCU, the EEPROM data content displays automatically. Status bar : Displays programmer's current status: the chip write in is not correct, wrong programming position, programmer problem and so on. Chip's parameter is showed below the Chip Select Button. Normaly, those parameters are no need to adjusted, using default value. Size&checksum: shows chip's capacity and data buffer's checksum. 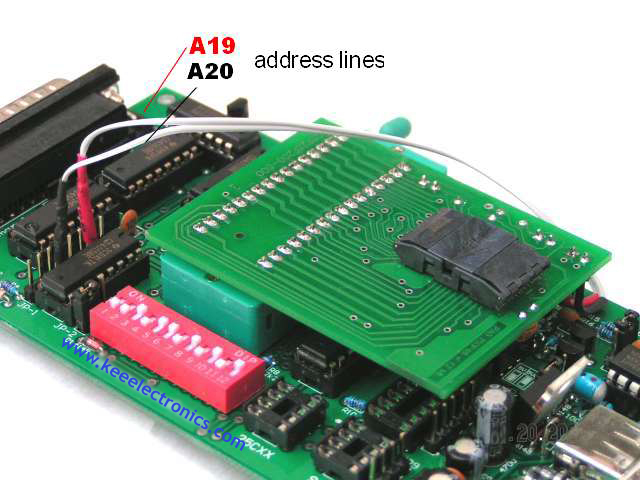 Shift&pattem adress: shows chip's address line to be used and highest address bit. tWP/WC: shows programming pulse width and delay time. After DIP set, check the chip's position. 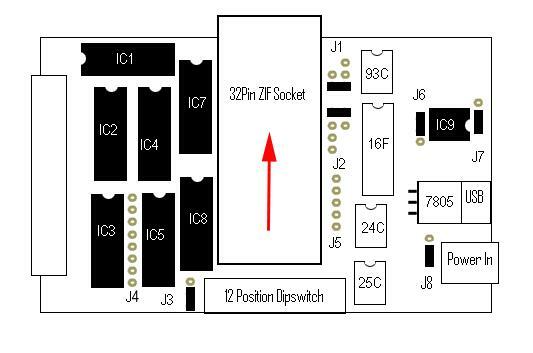 For BIOS chip, it should be placed in the 32 pins ZIF socket. 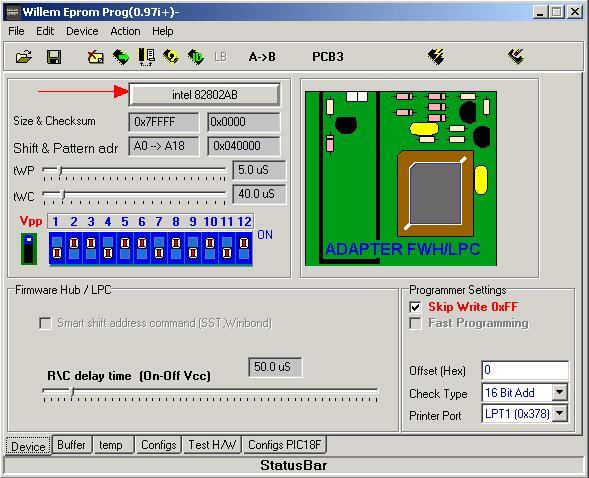 For N82802AB chip, the program prompt user need a FWH/LPC adaptor. 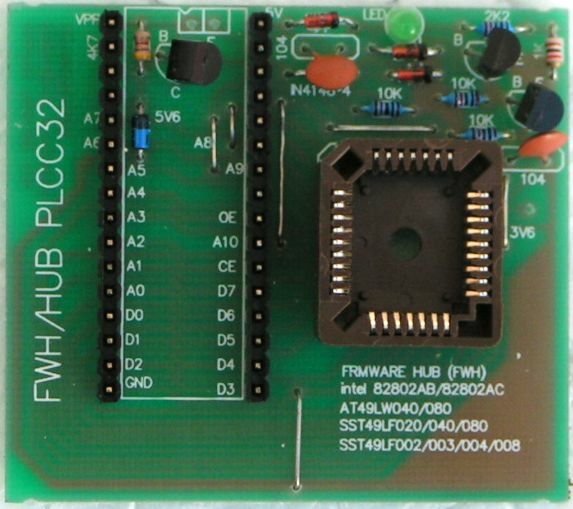 Please make sure the pin one position on the FWH/LPC adaptor. Note: 1,Displayed chip's parameter is no need to be ajusted. 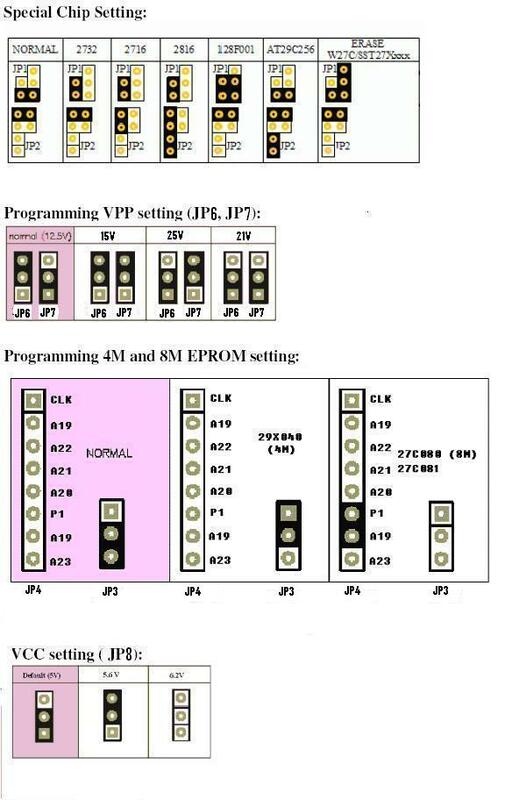 3, For EPROM chip, we need resetting the DIP, speicial chip and special valtage follow the prompt of software. After selected the chip, we can click on the "Read" button. All data will be put into the buffer. 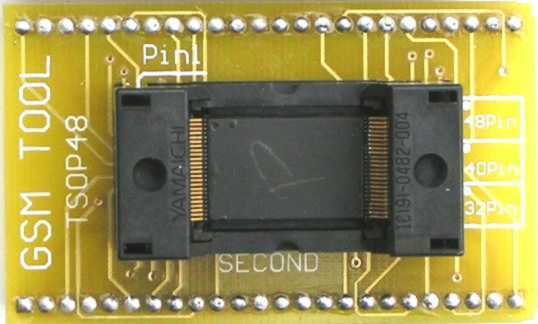 When reading the chip, the yellow LED will be light up, indicats that the valtage is been applied on the chip. After insert the chip, click on "Open file" to open your data file. Then click on "Programm Chip" button. Note, some of chip need erase before write. When programming, the yellow LED will be on. If the chip need a Vpp programming voltage, the red LED will be on. 1), Select the chip type and then put in the original chip. 2), "read" the data into buffer. 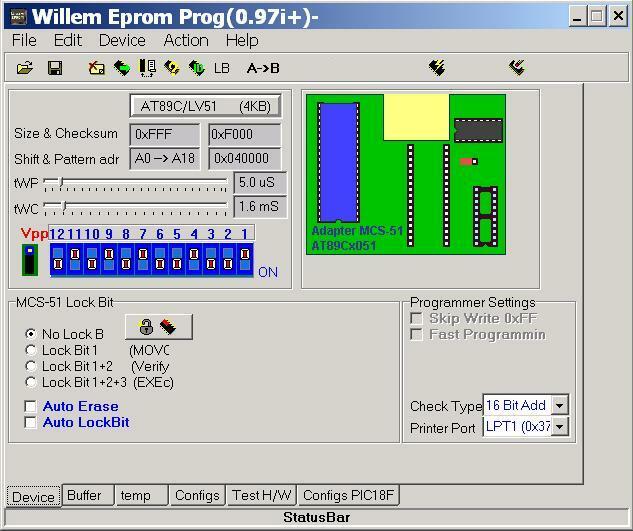 3), Put in the target chip and then click "Programm Chip". Note: the chip may be damaged if wrong chip type selectd or chip in a wrong direction in socket. The following parameter is for advanced user only. R/C delay time: programming pulse delay. If your computer is too fast, you may need increase the delay. Skip Write 0xFF: Enable this setting will skip the 0xFF when programming. Fast Programming: For a fast programming mode if it is enabled. Printer Port: LPT1(0X378), printer port selected. Offset: setting programming start offset affress. Check Type: You can select the way to check either 32 bit CRC or 16 bit add. 1, some of chip need to be erased in order to programming. Such as SST39SF020. 2 Always put the chip in the programmer at the last step. Because the programmer is in a unstable state when windows is starting up. 3, Do not interrupt the programming procedure. Press the "Stop" button if needed. 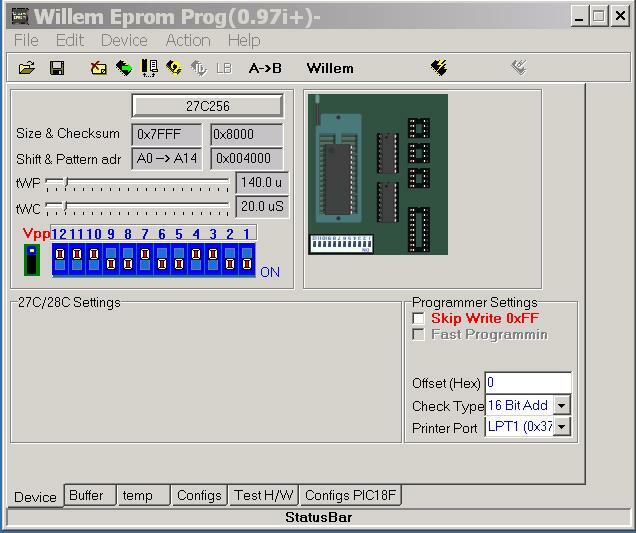 The operation to EPROM chip is similar to general BIOS chip. The main diffrence is: the programmer jumper needs relevant ground setup. As an example: write a 27C16(programming voltage is 12.5V), also you need change the Vcc voltage setting accordingly. Some chips need the Vcc set to 6.2V when doing programming. 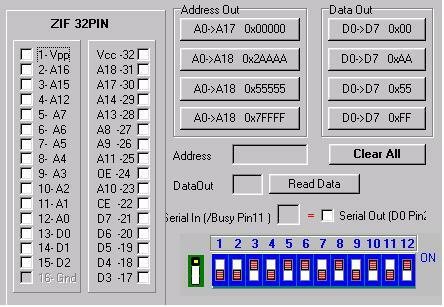 Set the chip and make sure the jumper for that chip is correct , the program displays the DIP switch setting. Follow the figure to set up the DIP switch, includes the jumper next to DIP switch. The DIP switch setup is: toward to upper side is on, toward to bottom side is off. As to above figure, the DIP switch is: ON, ON, OFF, OFF, OFF, ON, OFF, ON, ON, OFF, OFF, OFF. After DIP switch set-up, insert the chip to 32 PIN ZIF socket, check the special chip setting is correct. The follows operation is read in data file, programming. When programming, the red indicator lights up. This shows the programmer has corect voltage Vpp. 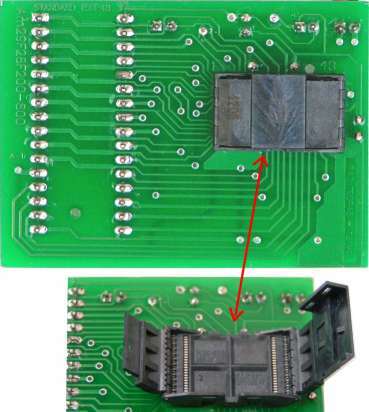 Note:if wrongly selected the chip type, the EPROM chip may be damaged. Some EPROM chip, like W27C512 or W27C512,they are 27series, but erasable electronically. 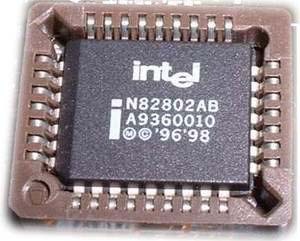 When programming this type, besides the DIP setup and insertion of IC into 32 PIN ZIP socket, the chip has to be erased first (using a jumper, will be described in the following paragraph). 2) Set the programming voltage VPP to 15V, an extra jumpwer should be inserted according to the jumper setting table (please consult with the jumper setting section of this manual). 3) Insert W27CXX to 32PIN ZIP socket, click the software upper right corner Erase button, the chip will get erased. Make sure the extra jumper for erasing has been removed before you start programming your W27CXX. This programmer supports: 27SF256, 512, 010, 020, 040;37VF512, 010, 020, 040. 2) Set the programming voltage VPP auto to 15V, an extra jumpwer should be inserted according to the jumper setting table (please consult with the jumper setting section of this manual). 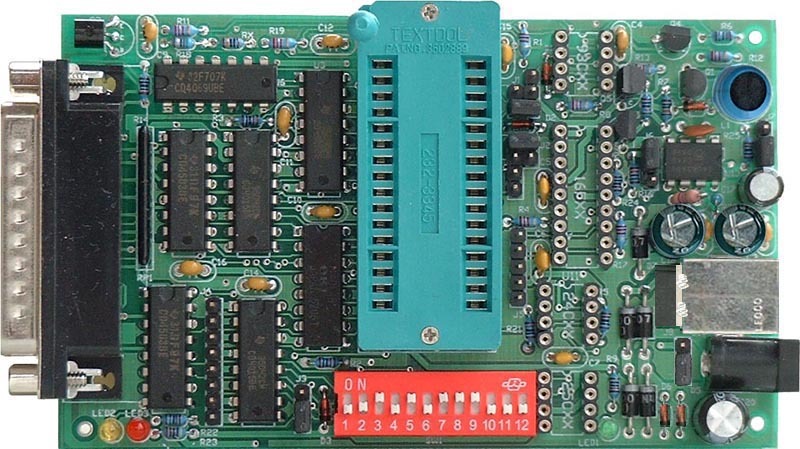 3) Insert W27CXX to 32PIN ZIP socket, click the software upper right corner Erase button, your chip will get erased. Make sure the extra jumper for erasing has been removed before you start programming your W27CXX. LockBit1:forbiden MOVC instruction and programming again. 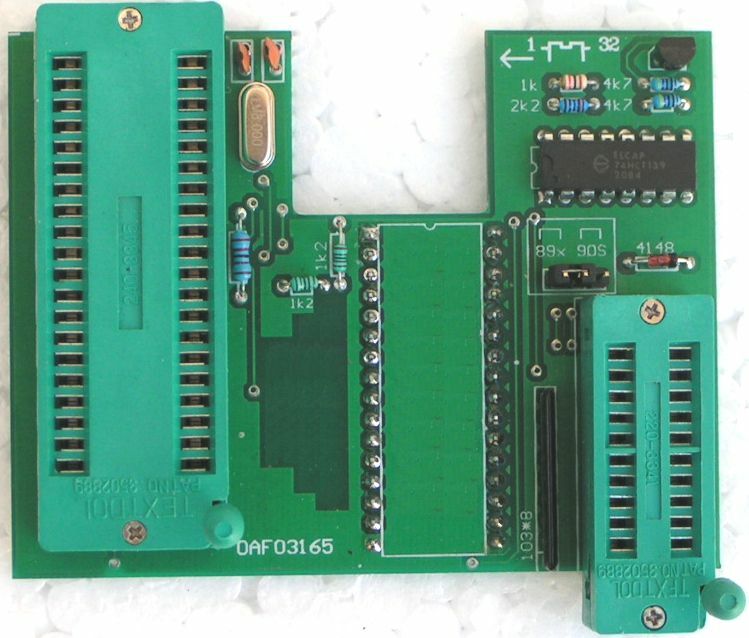 As to AVR chip, choose the target chip,the program prompts the correct adapter socket. 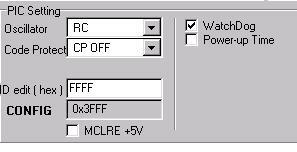 Meanwhile, at the chip configuration area, display the right setup list in order to choose PIC MCU configuration parameters. 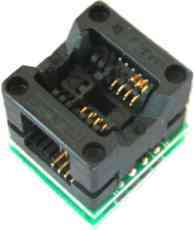 By using this adapter, it is able to program MCS-51 series MCU. The MCU includes ATMEL & INTEL. 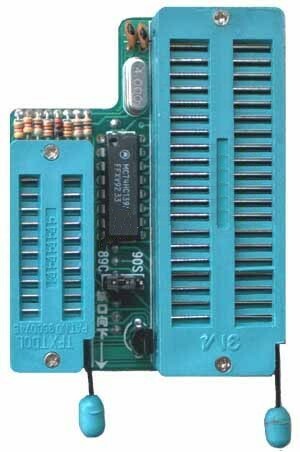 This adaptor is able to program MCS-51 series PLCC MCU, such as 89C51PLCC44. 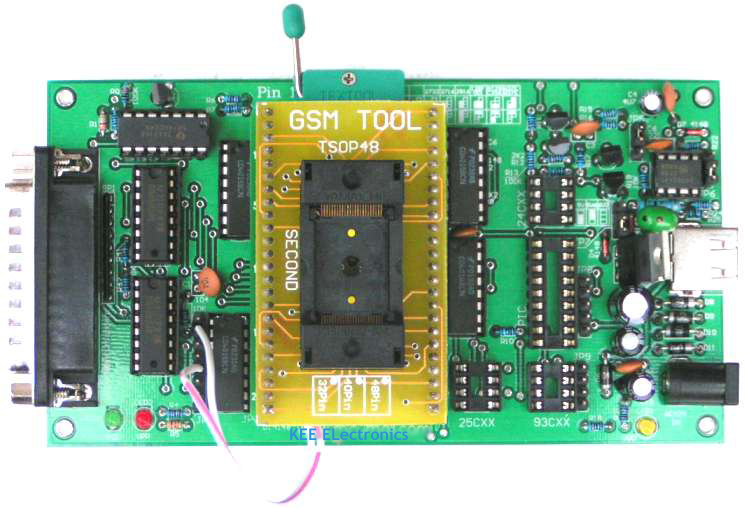 Please note, it is used with ATMEL89 Adapor. 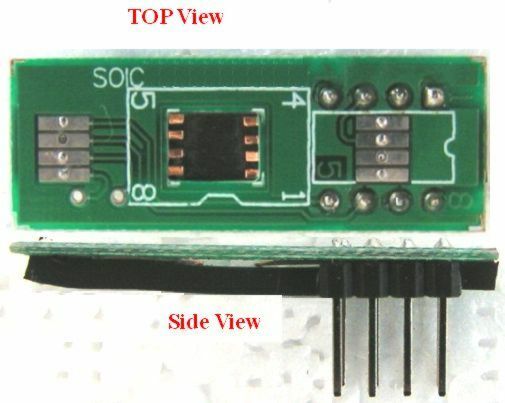 This adaptor is able to program TSOP48 flash chip. More details please see supported device list. The default jumper setting on the base board is above. Please change it as needed. JP2 jumper keep it close normorlly. It will increase the compatibility betwwen the similar device . Only try to open it for some chip if programming fail. The JP2 jumper is not in the original design and it also not documented for the most of chip. TSOP48-S adaptor, which is replacement of TSOP48 adaptor with 100% compatibility. Cost for value some more.